If you own a home north of Toronto, you'd better sit down. Condo towers overlooking Vancouver's False Creek. Condo prices per square foot in the city centre have soared 40 per cent over the past year, according to a survey from Century 21 Canada. 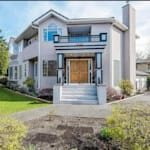 A new study from realtor Century 21 breaks down house prices in Canada per square foot and neighbourhood by neighbourhood, and what it finds is a seriously unpredictable market over the past year, with a few tremendous winners ... and some losers. "Trends in real estate prices per square foot have been fickle for the last year — soft in some cities but stable in others, even varying from suburb to suburb in some cases," Century 21 Canada said in its report. "The trend of fluctuating prices has very likely only increased further since our cut-off for data earlier this summer," executive vice-president Brian Rushton said. While Vancouver's housing market went into serious slowdown mode over the course of this year, condo prices in the city's downtown core have soared, up by nearly 40 per cent in a year, Century 21's survey found. That makes downtown Vancouver the most expensive real estate market in Canada, at $1,345 per square foot. Market experts say seriously unaffordable detached home prices in Toronto and Vancouver have pushed more people into the condo market, pushing up prices even as single-family home sales slow. After a weak start to the year, Toronto's housing market is showing signs of stabilizing, but Century 21's data some low-rise suburbs have seen major price declines, particularly those north of the city. Markham and Richmond hill have seen house prices per square foot drop by about 24 per cent, while prices in Vaughan dropped 17.7 per cent. In essence, these markets have given back much of the gains they made during the frenzy of 2016 and early 2017. It's a completely different story in downtown Toronto, where condo prices jumped 10.3 per cent in a year. At $903 per square foot, a minuscule 400-square-foot studio apartment will now run you around $360,000. But the crown for most volatile housing market goes to Peterborough, Ont., where house prices have fallen by about 24 per cent on a per-square-foot basis in the past year. At the same time, condo prices there soared by 24 per cent. The city makes the list of top 10 fastest-growing house prices and the list of fastest-falling prices. Case in point: For the price of a downtown Vancouver property, you could buy 13 or 14 homes of equivalent size in Moncton, N.B., the country's least expensive housing market. That's basically your own neighbourhood. You know, for when friends and family visit. Century 21 compiled the price data based on sales at its own franchises, and reported numbers for markets where the franchisee "has confirmed that that the numbers provided are an accurate representation of their market." "It will be very interesting to compare this year's survey to next year's, given the impacts in some metropolitan centres of new legislation, restrictions on foreign ownership, rising interest rates, and global trade conflicts this past summer," Rushton said.